Last week I wrote a series of posts (starting with this and ending with this) that were mainly motivated by a single objective: to show how taking the accounting identity between savings and investment seriously can get someone, even a very fine economist, into serious trouble. That, I suggested, is what happened to Scott Sumner when, in a post about whether a temporary increase in government spending and taxes would increase GDP, he relied on the accounting identity between savings and investment to conclude that a reduction in savings necessarily leads to a reduction in investment. Trying to trace Scott’s mistake to misuse of an accounting identity led me a little further than I anticipated into the substance of the argument about how a temporary increase in government spending and taxes affects GDP, an argument that I am still not quite satisfied with, but which – you can relax — I am not going to discuss in this post. My aim in this post is merely to respond to one of Scott’s rejoinders to me, which is that he was just relying on a proposition – the identity of savings and investment – that is taught in just about every macro textbook, including textbooks by Paul Krugman and Greg Mankiw, two of the current heavyweights of the profession. If so, Scott observed, my argument is not really with him, but with the entire profession. No doubt about it, Scott has a point, though I think that most textbooks and most economists have an intuitive understanding that the accounting identity is basically a fudge, and therefore, unlike Scott, generally do not rely on it for any substantive conclusions. The way that most textbooks try to handle the identity is to say that the identity really just refers to realized (ex post) saving and investment which must be equal, while planned (ex ante) investment and planned (ex ante) saving may not be equal, with the difference between planned investment and planned saving corresponding to unplanned investment (accumulation) of inventories. Equilibrium is determined by the equality of planned investment and planned saving, and any disequilibrium (corresponding to a divergence between planned saving and planned investment) is reflected in unplanned inventory accumulation (either positive or negative) which ensures that the identity between realized investment and realized saving is always satisfied. The usual fudge distinguishing between planned and realized investment and saving and postulating that unplanned inventory investment is what accounts for any difference between planned investment and saving is itself problematic, but it at least puts one on notice that there is a difference between an equilibrium condition and an accounting identity, while nevertheless erroneously suggesting that the accounting identity has some economic significance. Not entirely coincidentally, Scott having got started on this topic by responding to a post by Paul Krugman, Krugman himself weighed in on the subject of accounting identities last week, enthusiastically citing a post by Noah Smith warning about the misuse of accounting identities in arguments about economics. Now the truth is that there is not too much in Krugman’s post that I disagree with, but there are certain verbal slips or misstatements that betray the confusion between accounting identities and equilibrium conditions that I am trying to get people to recognize and to stay away from. While avoiding any substantive error, Krugman perpetuates the confusion, thus contributing unwittingly to the very problem that motivated his post. Thus, his confusion is not just annoying to compulsive grammarians like me; it is also unnecessary and easily avoidable, and creates the potential for more serious mistakes by the unwary. So there is really no excuse for continuing to pay lip service to the supposed identity between savings and investment, regardless of how deeply entrenched it has become as the result of many decades of unthinking, rote repetition on the part of textbook writers. What he’s referring to, I assume, is arguments like “since savings equals investment, fiscal stimulus can’t affect overall spending”, or “since the current account balance is equal to the difference between domestic saving and domestic investment, exchange rates can’t affect trade”. The first argument is, more or less, Say’s Law and/or the Treasury view. The second argument is what John Williamson called the doctrine of immaculate transfer. This is pretty straightforward, though I don’t care for the examples that Krugman gives, displaying a conventional misunderstanding of Say’s Law. But Say’s Law is a whole topic unto itself. Nor can the Treasury view be dismissed as nothing more than the misapplication of an accounting identity. So I’m just going to ignore those two specific examples for purposes of this discussion. Back to Krugman. Why are such arguments so misleading? Noah doesn’t fully explain, so let me put in a further word. As I see it, economic explanations pretty much always have to involve micromotives and macrobehavior (the title of a book by Tom Schelling). That is, when we tell economic stories, they normally involve describing how the actions of individuals, driven by individual motives (and maybe, though not necessarily, by rational self-interest), add up to interesting behavior at the aggregate level. Again, nothing to argue with there, though the verb “add up” has just faintest whiff of an identity insinuating itself into the discussion. And the key point is that individuals in general [as opposed to those strange creatures called economists who do care about “aggregate accounting identities?] neither know nor care about aggregate accounting identities. Ok, now we are starting to have a problem. Individuals in general neither know nor care about aggregate accounting identities. Does that mean that those strange creatures called economist should know or care about aggregate accounting identities? I have yet to hear any cogent reason why they should. Take the doctrine of immaculate transfer: if you want to claim that a rise in savings translates directly into a fall in the trade deficit, without any depreciation of the currency, you have to tell me how that rise in savings induces domestic consumers to buy fewer foreign goods, or foreign consumers to buy more domestic goods. Don’t tell me about how the identity must hold, tell me about the mechanism that induces the individual decisions that make it hold. Here is where Krugman, after skating on the edge, finally slips up and begins to talk nonsense — very subtle nonsense, but nonsense nonetheless. What does it mean to say that an identity must hold? It means that, by the very meaning of the terms that one is using, the identity of which one is speaking must be true. It is inconceivable that an identity would not hold. If the difference between investment and savings (in an open economy) is defined to be identitically equal to the trade deficit, then talking about a mechanism that induces individual decisions to make it hold makes as much sense as saying that there must be a mechanism that induces individual decisions to make 2 + 2 equal 4. If, by the very meaning of the terms that I am using, the difference between investment and savings must equal the trade deficit (which, to repeat, is what it means to say that there is an identity between those magnitudes) there is no conceivable set of circumstances in which the two magnitudes would not be equal. If, in the very nature of things, two magnitudes could never possibly be different, it is nonsense to say that there is a mechanism of any kind (much less one describable in terms of the decisions of individual human beings) that operates to bring it about that the equality actually holds. And once you do that, you realize that something else has to be happening — a slump in the economy, a depreciation of the real exchange rate, it depends on the circumstances, but it can’t be immaculate, with nothing moving to enforce the identity. No, no! A thousand times no! If we are really talking about an identity, nothing has to be happening to enforce the identity. Identities don’t have to be enforced. Something that could not conceivably be otherwise requires nothing to prevent the inconceivable from happening. When it comes to confusions about the macro implications of S=I, again the question is how the identity gets reflected in individual motives — is it via the interest rate, via changes in GDP, or what? There are no macro implications of an identity; an identity has no empirical implications of any kind — period, full stop. If S necessarily equals I, because they have been defined in such a way that they could not possibly be unequal, then there is no conceivable state of the world in which they are unequal. Obviously, if S and I are equal in every conceivable state of the world, the necessary identity between them cannot rule out any conceivable state of the world. That means that the identity between S and I has no empirical implications. It says nothing about what can or cannot be observed in the real world at either the micro or the macro level. Accounting identities are important; in fact, they’re the law. But they should inform your stories about how people behave, not act as a substitute for behavioral analysis. I have been rather (perhaps overly) harsh in my criticism on Krugman, but not to show that I am smarter than he is, which I certainly am not, but to show how easily habitual ways of speaking about macro lead to (easily rectifiable) nonsense statements. The problem is not any real misunderstanding on his part. Indeed, I would be surprised if, should he ever read this, he did not immediately realize that he had been expressing himself sloppily. The point is that macroeconomists have gotten into a lot of bad habits in describing their models and in failing to distinguish properly between accounting identities, which are theoretically unimportant, and equilibrium conditions, which are essential. Everything that Krugman said would have made sense if he had properly distinguished between accounting identities and equilibrium conditions rather than mix them up as he did, and as textbooks have been doing for three generations. Savings and investment are equal in equilibrium, because that equality is a necessary and sufficient condition for the existence of an equilibrium. If so, being out of equilibrium means that savings and investment are not equal. So if we think that a real economy is ever out of equilibrium, one way to test for the existence of disequilibrium would be to see if actual savings and actual investment are unequal, notwithstanding the presumed accounting identity between savings and investment. That accounting identity is a product of the special definitions assigned to savings and investment by national income accounting practices, not by the meaning that our theory of national income assigns to those terms. PS I will once again mention (having done so in previous posts on accounting identities) that all the essential points I am making in this post are derived from the really outstanding and unfortunately not very widely known paper by Richard G. Lipsey, “The Foundations of the Theory of National Income” originally published in Essays in Honour of Lord Robbins and reprinted in Macroeconomic Theory and Policy: Selected Essays of Richard G. Lipsey. In my previous post, I pointed out that inflation (measured by both the GDP price deflator and the Personal Consumption Price Index) in the fourth quarter has fallen back to a level well below the Fed’s 2% target. Indeed, it is running at nearly the lowest rate since the end of World War II. Later, when reading this post by Noah Smith commenting on this post by John Taylor’s (also see Taylor’s op-ed in the Wall Street Journal), it occurred to me that, viewed from the perspective of the current rhetoric about sound money and proposals to eliminate the dual mandate of the Fed and impose on the Fed a single unambiguous mandate of maintaining price stability, it is hard to understand why some people are so harshly critical of Mr. Obama’s record as President. If price stability is really the alpha and omega of monetary policy, then, based on his success in keeping inflation low, shouldn’t Mr. Obama be rated the most economically successful President in living memory? If, despite President Obama’s stellar record in suppressing inflation – either directly or through his re-appointment of Ben Bernanke as Fed Chairman — is not enough to mollify the critics who loudly assert that the only macroeconomic objective of the Federal Reserve Board should be to ensure price stability, doesn’t that suggest that they actually care about more than price stability and that calls for the Fed to stop paying attention to anything but the rate of inflation are perhaps less than 100% sincere? After all, inflation is lower now than it was during the administration of Ronald Reagan, and aside from his reputation as the quintessential Conservative, Reagan is also viewed as the slayer of inflation and the very paragon on a sound money man. So I thought that it might be useful to go back and see what the Reagan administration itself had to say about inflation while it was in office. So herewith I provide a few excerpts from the Annual Reports of the Council of Economic Advisers published in the Economic Report of the President during the Reagan Presidency. So it seems that President Reagan and his economic advisers thought that they were doing well to keep inflation at 4 percent a year. Sure, they would have liked to get the inflation rate down a bit, but they weren’t prepared to risk even a slowdown in the rate of decrease in unemployment to reduce inflation, much less tolerate any increase in the unemployment rate. Promised reductions in the rate of inflation below the steady 3.5-4% rate that prevailed for the most part after the recovery started in 1983 just kept getting deferred further and further into the future. Is that a record that John Taylor would like the next President of the United States to emulate? Today’s announcement of the prelminary estimate of GDP for the fourth quarter of 2011 showed a modest improvement over the anemic growth rates earlier in the year, confirming the general impression that things have stopped getting worse. But we are barely at the long-run trend rate of growth, which means that there is still no recovery, in the sense of actually making up the ground lost relative to the long-run trend line since the Little Depression started. The other striking result of the GDP report is that NGDP growth actually fell in the fourth quarter to a 3.2% annual rate, implying that inflation as measured by the GDP price deflator was only at a 0.4% annual rate, a sharp decline from the 2.6-2.7% rates of the previous three quarters. The decline reflects a possible tightening of monetary policy after QE2 was allowed to expire (though as long as the Fed is paying 0.25% interest on reserves, it is difficult to assess the stance of monetary policy) as well as the passing of the supply-side disturbances of last winter that fueled a rise in energy and commodity prices. So we now seem to be back at our new trend inflation rate, a rate clearly well under the 2% target that the FOMC has nominally adopted. Despite the continuing cries about currency debasement and the danger of hyperinflation from all the usual suspects, current rates of inflation remain at historically low levels. 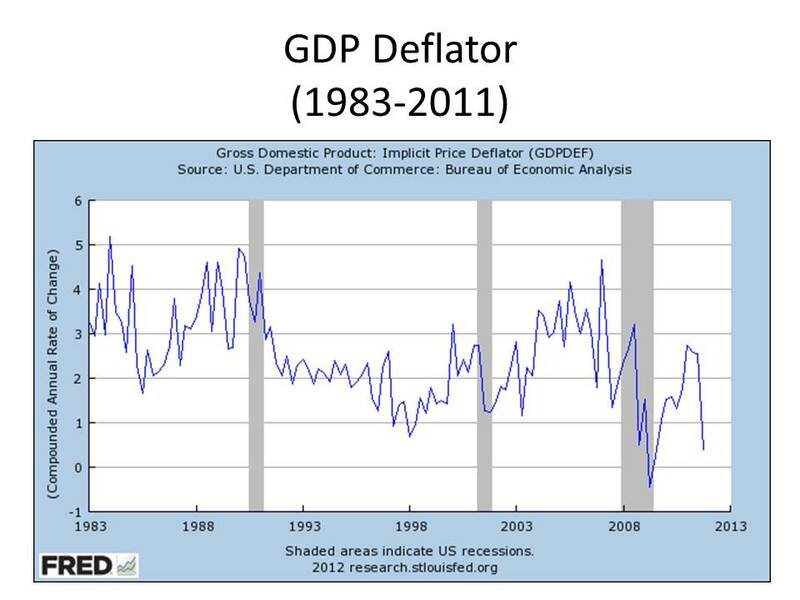 The first of the two accompanying charts tracks the GDP price deflator since 1983. The deflator is clearly well below the rates that have prevailed since 1983 when the recovery to the 1981-82 recession started under the sainted Ronald Reagan of blessed memory. The divergence between inflation in the Reagan era and the Obama era is striking. Inflation under the radical Barack Obama is well below inflation under that quintessential conservative, Ronald Reagan. Go figure! 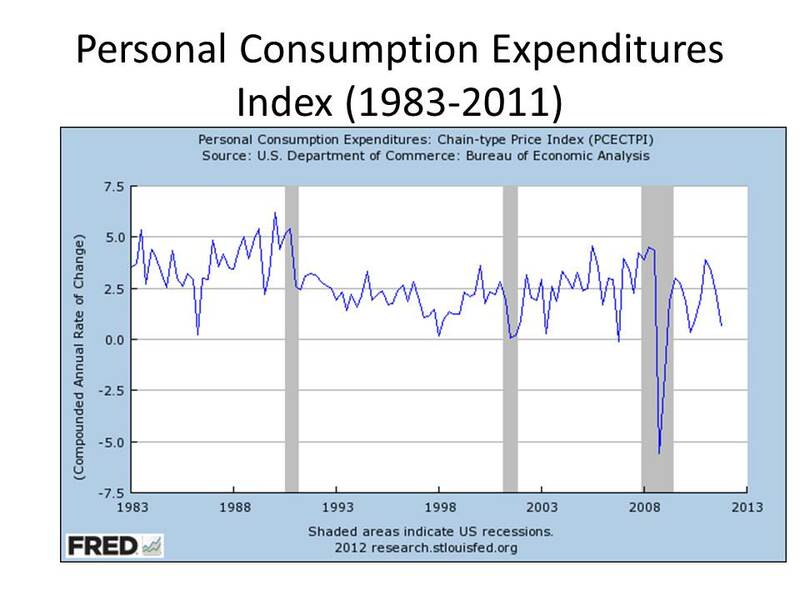 The companion chart tracks the Personal Consumption Price index over the same period. The PCE index is similar to the CPI, and shows a similar (but even sharper) decline in the fourth quarter compared to the higher rates earlier in the year, owing to the importance of food and energy prices in the PCE index. Again the contrast between inflation under Reagan and under Obama is clear. In his press conference on Wednesday, Bernanke signaled, to the apparent dismay of the Wall Street Journal editorial board, that he will push for a monetary policy that adjusts as needed to keep the inflation rate from falling below 2% and might even tolerate some overshooting while unemployment remains unusually high. That signal apparently caused an immediate increase in inflation expectations as measured by the TIPS spread. The increase in inflation expecations was accompanied by a further decline in real interest rates, now -1% on 5-year TIPS and -0.16% on 10-year TIPS. With real interest rates that low, perhaps we will see a further increase in investment and a further increase in household purchases of consumer durables. Perhaps some small reason for optimism amid all the reasons to be depressed. The point is to keep trying until you get it right. I am sorry to say that I got it wrong last time, so I’m taking another shot at it. where b represents the marginal propensity to consume out of income. E0 = 200 + bY0. Now the case that I posited in my previous post involved b = 0, reflecting income smoothing. This is tricky, because we have to make an assumption about what households expect their income to be in the next period, which can be assumed to be long relative to the initial period, though for simplicity I’m going to let the two periods be equal in length. If households expect income in the next period to reflect full employment, presumably they would try to increase their consumption now, spending more and increasing equilibrium income now, so there is an inherent inconsistency in the model which needs to be resolved, but I am not going to worry about that either. Let’s just take the model at face value. In this equilibrium, note that consumption, C0, is 100, investment, I0, is 100, and saving, S0, is also 100. What happens if the government immediately tries to intervene to raise income by increasing government spending, G0, from 0 to 100, and imposes taxes, T0, of 100 to finance its spending? The increased spending is only for this period and the taxation is only for this period, not the next one; in period 1, government spending and taxation go back to zero. What this does is to cause the consumption function to be revised as households choose a uniform level of consumption to be maintained for both periods, reflecting the liability to pay taxes this period, but no obligation to pay taxes next period. C’0 = 50 + bY0, where b is again equal to 0. E’0 = 250 + b(Y’0 – 100). E’0 = 250 = Y’0. We still have I0 = S0 = 100. Since b = MPC = 0, (1-b) = MPS = 1. The increase in income from 200 to 250 is just enough to generate another 50 in savings to offset the 50 in borrowing required to keep consumption level at 50 in period 0 and period 1. The increase in government spending and taxes of 100 in period 0 raises the period-0 equilibrium (as compared with the case with no government spending and taxes) is 50, so the multiplier is .5. Of course, this is not a full-equilibrium solution. A full equilibrium should have Y1 also equal to 250 instead of 200, which means that consumption could have been increased by 25 in both periods, but I haven’t worked that solution out yet. The reason why in this post I arrive at a result different from the result in my previous post is that I made a simple flunk-the-quiz mistake in the previous post, reducing the expenditure curve by 100 to reflect the reduction in disposable income from taxes as if it were a permanent reduction in disposable income rather than a one-period reduction in disposable income. So instead of assuming the MPC was 0 as I wanted to do, I was assuming, for purposes of the effect of taxes on consumption, an MPC of 1. Yikes! My assertion that everything depended on a positive MPC was entirely wrong. In a simple Keynesian model, you get a balanced-budget multiplier of 1 provided that the MPC is less than 1. That was a pretty bad blunder on my part, and I apologize. Scott, himself, seemed to perceive that something was amiss in a comment on the previous post, so I hope that we are now converging toward a solution. Again my apologies for hastily posting my previous post without checking my work more carefully. I had better get some rest now. UPDATE (01/25/12): This post is erroneous and none of its conclusions should be relied upon. OK, so it has come down to this. I just asserted that the way to translate Lucas and Cochrane into the Keynesian model is to set the mpc equal to zero. In that case, any increase in government spending that is offset by taxes causes no net increase in income, because as, Lucas puts it, the increase in government spending is exactly offset by a decrease in consumption of an equal amount thanks to the reduction in after-tax income. This exercise is predicated on the assumption that the equal increase in government spending and taxes is permanent. But in the exercise proposed by Wren-Lewis, the increase in government spending is temporary and the increase in taxes is also temporary. How does the transitory nature of the increase in government spending and taxes alter the analysis under a Lucasian version of the Keynesian model? Wren-Lewis claimed that you get a stimulative effect. The increase in government spending is concentrated in the present, but the reduction in spending is spread out over the future, leaving a net positive effect in the current period. PS At this stage, I am fully prepared to be proven wrong yet again, so I will be reading your comments very carefully to find the next surprise lying in store for me. Update: Continue reading, but then go to my next post to find out how it all turns out in the end. But, if we do build the bridge by taking tax money away from somebody else, and using that to pay the bridge builder — the guys who work on the bridge — then it’s just a wash. It has no first-starter effect. There’s no reason to expect any stimulation. And, in some sense, there’s nothing to apply a multiplier to. (Laughs.) You apply a multiplier to the bridge builders, then you’ve got to apply the same multiplier with a minus sign to the people you taxed to build the bridge. Paul Krugman followed up with a blast of his own at both Cochrane and Lucas, and John Cochrane weighed in, defending himself and Lucas. The battles among the principals were accompanied by various interventions on either (or neither) side by Brad DeLong, Scott Sumner, Nick Rowe, Karl Smith (to name just a few) and by responses and rejoinders by Cochrane, Wren-Lewis and Krugman. I got involved mainly because I was upset that my friend Scott Sumner seemed to be making arguments invoking accounting identities in ways that I thought were illegitimate and even nonsensical. Scott, though apparently intervening on the side of Lucas and Cochrane, denied that he was supporting their substantive position, a denial that I, though apparently intervening on the side of Wren-Lewis and Krugman, also made. I am not going to repeat my previous arguments against Scott, which mostly involved denials that any useful implication can be inferred from an accounting identity. I will merely reiterate that I hate – despise — all accounting identities, and deny that they can ever have any substantive implications about anything, serving only one function, namely, to force us to obey the laws of arithmetic. OK, I got that out of my system, and now I feel well enough to go on. But surely very clever people cannot make simple errors of this kind? Perhaps there is some way to re-interpret such statements so that they make sense. They would make sense, for example, if the extra government spending was permanent. The only trouble is that both statements were made about a temporary fiscal stimulus package. My next step is a bit tricky because I am going to have to refer to Scott’s criticism of Wren-Lewis, which, I must admit, I still do not fully understand. But the gist of at least part of what Scott was trying to say — and he, as well as Karl Smith, has repeated it in responding to me several times — is that Wren-Lewis was trying to force Lucas and Cochrane to accept the validity of the Keynesian model, when they simply don’t accept the model. My basic response to that has been that you can’t have a discussion about the effects of a policy unless you have some (at least implicit) model from which you are deriving your conclusions. It is not enough to invoke an accounting identity from which no conclusions (as Scott agrees) can be deduced. My first attempt to specify some model from which we could deduce the position adopted by Lucas and Cochrane was not too successful. I suggested that what they had in mind was some sort of crowding-out effect, the increase in government spending and taxes causing private investment to fall. I then combined this effect with a consumption-smoothing effect to produce a small short-term increase in Y as a result of building the bridge. This was unsatisfactory, because it was ad hoc, and because, as commenter John Hall pointed out, the change in consumption ought to (and could) have been derived rather than just assumed as I had done. But I realized when responding to Scott’s comment on my previous post, that there is a simple way to reconcile what Lucas and Cochrane are saying with the basic Keynesian model, which, after all, is just a tool of analysis compatible with a variety of substantive assertions about the real world. So it is not correct to say that it is an unfair imposition on Lucas and Cochrane to require their position to be expressed in terms of a Keynesian model that they obviously reject. The Keynesian model is pretty flexible, and, by appropriate assumptions, you can get almost any substantive implication you want. So how does one interpret Lucas and Cochrane? Simple. They believe that households are rational maximizers basin their consumption decisions on their expected future income stream and expected future tax liabilities. They therefore engage in consumption smoothing, so that current consumption is fixed and independent of variations in current income, such variations being capitalized into their expected future income streams. Thus, the MPC out of current income in such a model is 0. In terms of the Keynesian cross, you have an aggregate expenditure line that is horizontal (reflecting a 0 MPC). The multiplier with respect to a change in autonomous expenditure is one. However, since all government spending must be financed eventually by taxes, Ricardian equivalence implies that the increase in G is offset by an equal reduction in C, reflecting the effect on consumption of expected future taxes. That is precisely what Lucas and Cochrane were saying in the quotations above. Wren-Lewis, in his criticism, accepted that position. His point was that if the increase in government spending is temporary, the increase in government spending in the current period will rise by more than the fall in consumption this period due to the effect of expected future taxes (or borrowing this period to pay part of the current tax bill). This is not necessarily the end of the story (though, with a bit of luck, perhaps it will be), but this is the framework within which the argument must be carried out. It has nothing to do with accounting identities. PS By the way Nick Rowe apparently had this all figured out almost two weeks ago. He could have saved us all this agony. But the truth is we loved every minute of it. Why Am I Arguing with Scott Sumner? This is going to be my third consecutive post about Scott Sumner (well, not only about Scott), and we seem to be arguing about something, but it may not be exactly clear what the argument is about. Some people, based on comments on this and other blogs, apparently think that I am defending the Keynesian model against Scott’s attacks. Others even accuse me of advocating – horrors! – tax and spend policies as the way to stimulate the economy. In fact, Scott himself seems to think that what I am trying to do is defend what he calls the hydraulic Keynesian model. That’s a misunderstanding; I am simply trying to enforce some basic standards of good grammar in arguing about economic models, in this case the hydraulic Keynesian model. I am not a fan of the hydraulic Keynesian model, but most economists, even anti-Keynesians like Hayek (see here), have acknowledged that in a severe recession or depression, when there is substantial unemployment of nearly all factors of production, the model does provide some insight. I have also explained (here and here) that it is possible to translate the simple Keynesian model of a depression and a liquidity trap into the language of the supply of and demand for money. So at some level of generality, the propositions of the Keynesian model can be treated as fairly trivial and non-controversial. So what do I mean when I say that I am just trying to enforce basic standards of good grammar? I mean that good grammar is not about what you choose to say; it is about how you say it. Using good grammar doesn’t prevent you from saying anything you want to; it just prevents you from saying it in certain not very comprehensible ways. If you use good grammar, you enhance your chances of saying what you want to say coherently and avoiding needless confusion. Sure some grammatical rules are purely conventional or nitpicks, but good writers and speakers know which grammatical rules can be safely ignored and which can’t. Using bad grammar leads you make statements that are confusing or ambiguous or otherwise incoherent even though the point that you are trying to make may be perfectly clear to you. Making the point clear to someone else requires you to follow certain semantic rules that help others to follow what you are saying. It is also possible that when you make an ungrammatical statement, you are disguising (and at the same time revealing) some confusion that you yourself may not be aware of, and had you made the statement grammatically you might have become aware that you had not fully thought through what you were trying to say. So in a discussion about the Keynesian model, I regard myself as a neutral observer; I don’t care if you are making a statement for or against the model. But I want you to make the statement grammatically. That’s right; my problem with Scott is that he is using bad grammar. When Scott says he can derive a substantive result about the magnitude of the balanced-budget multiplier from an accounting identity between savings and investment, he is making a theoretically ungrammatical statement. My problem is not with whatever value he wants to assign to the balanced-budget multiplier. My problem is that he thinks that he can draw any empirically meaningful conclusion — about anything — from an accounting identity. Scott defends himself by citing Mankiw and Krugman and others who assert that savings and investment are identically equal. I don’t have a copy of any of Krugman’s textbooks, so I don’t know what he says about savings and investment being identically equal, but I was able to find the statement in Mankiw’s text. And yes, he does say it, and he was speaking incoherently when he said it. Now, it is one thing to make a nonsense statement, which Mankiw obviously did, and it is another to use it as a step – in fact a critical step — in a logical proof, which is what Scott did. The unfortunate fact is that the vast majority of economics textbooks starting with Samuelson’s classic text (though not until the fourth edition) have been infected by this identity virus, even including the greatest economics textbook ever written. The virus was introduced into economics by none other than Keynes himself in his General Theory. He was properly chastised for doing so by Robertson, Hawtrey, Haberler, and Lutz among others. Perhaps because the identity between savings and investment in the national income accounts reinforced the misunderstanding and misconception that the Keynesian model is somehow based on an accounting identity between investment and savings, the virus withstood apparently conclusive refutation and has clearly become highly entrenched as a feature of the Keynesian model. The confusion was exacerbated because, in the most common form of the Keynesian model, the timeless, lagless form with the instantaneous multiplier, the model has meaning only in equilibrium for which the equality of savings and investment is a necessary and sufficient condition. This misunderstanding has led to completely illegitimate attempts to identify points on the Keynesian cross diagram away from the point of intersection as disequilibria characterized by a difference between planned (ex ante) and realized (ex post) savings or planned and realized investment. It is legitimate to refer to the equality of savings and investment in equilibrium, but you can’t extrapolate from a change in one or the other to determine how the equilibrium changes as a result of the specified change in savings or investment, which is what Scott tried to do. So, yes, the mistaken identification of savings and investment is distressingly widespread, but unfortunately Scott has compounded the confusion, taking it to an even higher level. Let me again cite as the key source identifying and tracking down all the confusions and misconceptions associated with treating savings and investment (or expenditure and income) as identically equal the classic paper by Richard Lipsey, “The Foundations of the Theory of National Income,” originally published in 1972 in Essays in Honour of Lord Robbins and reprinted in Lipsey Macroeconomic Theory and Policy: The Selected Essays of Richard G. Lipsey, vol. 2. That’s all for now. I still need to respond to some of Scott’s arguments in detail, clear up a mistake in my previous post and say some more about the savings is identically equal to investment virus. I won’t bother with another encomium to Scott Sumner. But how many other bloggers are there who could touch off the sort of cyberspace fireworks triggered by his series of posts (this, this, this, this, this and this) about Paul Krugman and Simon Wren-Lewis and their criticism of Bob Lucas and John Cochrane? In my previous post, after heaping well-deserved, not at all overstated, praise upon Scott, I registered my own perplexity at what Scott was saying. Thanks to an email from Scott replying to my post (owing to some technical difficulties about which I am clueless, his comment, and possibly others, to that post weren’t being accepted last Friday) and, after reading more of the back and forth between Scott and Wren-Lewis, I now think that I finally understand what Scott was trying to say. Unfortunately, I’m still not happy with him. Excuse me for reviewing this complicated multi-sided debate, but I don’t know how else to get started. It all began with assertions by Lucas and Cochrane that that old mainstay of the Keynesian model, the balanced-budget multiplier theorem, is an absurd result because increased government spending financed by taxes simply transfers spending from the private sector to the public sector, without increasing spending in total. Lucas and Cochrane supported their assertions by invoking the principle of Ricardian equivalence, the notion that the effect of taxation on present consumption is independent of when the taxes are actually collected, because the expectation of future tax liability reduces consumption immediately (consumption smoothing). Paul Krugman and Simon Wren-Lewis pounced on this assertion, arguing that Ricardian equivalence actually reinforces the stimulative effect of government spending financed by taxes, because consumption smoothing implies that a temporary increase in taxation would cause current consumption to fall by less than would a permanent increase in taxation. Thus, the full stimulative effect of a temporary increase in government spending is felt right away, but the contractionary effect of a temporary increase in taxes is partially deferred to the future, implying that a temporary increase in both government spending and taxes has a net positive immediate effect. [See update below] Now this response by Krugman and Wren-Lewis was just a bit opportunistic and disingenuous, the standard explanation for a balanced-budget multiplier equal to one having nothing to do with the deferred effect of temporary taxation. Rather, it seems to me that Krugman and Wren-Lewis were trying to show that they could turn Ricardian equivalence to their own advantage. It’s always nice to turn a favorite argument of your opponent against him and show that it really supports your position not his. But in this case the gambit seems too clever by a half. Enter Scott Sumner. Responding to Krugman and Wren-Lewis, Scott tried to show that the consumption-smoothing argument is wrong, and the attempt to turn Ricardian equivalence into a Keynesian argument a failure. I don’t know about others, but it did not occur to me on first reading that Scott’s criticism of Krugman and Wren-Lewis was so narrowly focused. The other problem that I had with Scott’s criticism was that he was also deploying some very strange arguments about the alleged significance of accounting identities, which led me in my previous post to make some controversial assertions of my own denying Scott’s assertion that savings and investment are identically equal as well as the equivalent one that income and expenditure are identically equal. This was a clever idea on Scott’s part. But implementing it is not so simple, because if you are working with the simple Keynesian model, you can’t help but get the balanced-budget multiplier automatically. (A balanced-budget multiplier of 1 is implied by the Keynesian cross. In the world of IS-LM, you must be in a liquidity trap to get a multiplier of 1. Otherwise the multiplier is between 0 and 1.) At this point, the way to proceed would have been for Scott to say, well, let’s assume that something in the Keynesian model changes simultaneously along with the temporary increase in both government spending and taxes that exactly offsets the expansionary effect of the increase in spending and taxes, so that in the new equilibrium, income is exactly where is started. So, let’s say that initially Y = 400, and G and T then increase by 100. The balanced-budget multiplier says that Y would rise to 500. But let’s say that something else also changed, so that the two changes together just offset one another, resulting in a new equilibrium with Y = 400, just as it was previously. At this point, Scott could have introduced consumption smoothing and determined how consumption smoothing would alter the equilibrium. First recall that C + I + G = AD = GDP = gross income in a closed economy. Because the problem involves a tax-financed increase in G, we can assume that any changes in after-tax income and C + I are identical. Suppose that because of consumption smoothing, any reduction in after-tax income causes C to fall by 20% of the fall in after-tax income. Then by definition saving must fall by 80% of the decline in after-tax income. So far nothing controversial; just basic national income accounting. It is not clear what accounting identity Scott is referring to; the accounting identities of national income accounting do not match up with the equilibrium conditions of the Keynesian model. But the argument is getting confused, because there are two equilibria that Scott is talking about (the equilibrium without consumption smoothing and the one with smoothing), and he doesn’t keep track of the difference between them. In the equilibrium without consumption smoothing, Y is unchanged from the initial equilibrium. Because after-tax income must be less in the new equilibrium than in the old one, taxes having risen with no change in Y, private consumption must be less in the new equilibrium than the old one. By how much consumption fell Scott doesn’t say; it would depend on the assumptions of the model. But he assumes that in the equilibrium with consumption smoothing, consumption falls by 20%. Presumably, without consumption smoothing, consumption would have fallen by more than 20%. But here’s the problem. Instead of analyzing the implications of consumption smoothing for an increase in government spending and taxes that would otherwise fail to increase equilibrium income, while reducing disposable income by the amount of taxes, Scott simply assumes that consumption smoothing leaves Y unchanged. Let’s follow Scott to the next step. Now let’s suppose the tax-financed bridge cost $100 million. If taxes reduced disposable income by $100 million, then Wren-Lewis is arguing that consumption would only fall by $20 million; the rest of the fall in after-tax income would show up as less saving. I agree. Again, Scott is assuming a solution to a model without paying attention to what the model implies. The solution of a model must be derived, not assumed. The only assumption that Scott can legitimately make is that Wren-Lewis would agree that without consumption smoothing the $100 million bridge financed by $100 million in taxes would not change Y. The effect on Y (and implicitly on C and S) of consumption smoothing must be derived, not assumed. Next step. But Wren-Lewis seems to forget that saving is the same thing as spending on capital goods. Thus the public might spend $20 million less on consumer goods and $80 million less on new houses. In that case private aggregate demand falls by exactly the same amount as G increases, even though we saw exactly the sort of consumption smoothing that Wren-Lewis assumed. But Wren-Lewis seems to forget that saving is the same thing as spending on capital goods. Thus the public might spend $20 million less on consumer goods and $80 million less on new houses. In that case private aggregate demand falls by exactly the same amount as G increases, even though we saw exactly the sort of consumption smoothing that Wren-Lewis assumed. Scott has illegitimately assumed a solution to a model after introducing a change in the consumption function to accommodate consumption smoothing, rather than derive the solution from the model. His numerical assumptions are therefore irrelevant even for illustrative purposes. Even worse, by illegitimately asserting an identity where none exists, he infers a reduction in investment that contradicts the assumptions of the very model he purports to analyze. To say “in that case private aggregate demand falls by exactly the same amount as G increases, even though we saw exactly the sort of consumption smoothing that Wren-Lewis assumed” is simply wrong. It is wrong precisely because saving is not “the same thing as spending on capital goods.” I know this is painful, but let’s keep going. Those readers who agree with Brad DeLong’s assertion that Krugman is never wrong must be scratching their heads. He would never endorse such a simple error. Perhaps investment was implicitly assumed fixed; after all, it is sometimes treated as being autonomous in the Keynesian model. So maybe C fell by $20 million and investment was unchanged. Yeah, that could happen, but in that case private after-tax income fell by only $20 million and there was no consumption smoothing at all. What Scott is saying is that if you were to assume that savings is not the same as investment, so that investment remains at its original level, then C + I goes down by only $20. Then in equilibrium, given that G = T, C + S, private after-tax income also went down by $20 million, in which case consumption accounted for the entire reduction in Y, which, if I understand Scott’s point correctly, contradicts the very idea of consumption smoothing. But the problem with Scott’s discussion is that he is just picking numbers out of thin air without showing the numbers to be consistent with the solution of a well-specified model. Let’s now go through the exercise the way it should have been done. Start with our initial equilibrium with no government spending or taxes. Let C (consumption) = .5Y and let I (investment) = 200. Equilibrium is a situation in which expenditure (E) equals income (Y). Thus, E ≡ C + I = .5Y + 200 = Y. The condition is satisfied when E = Y = 400. Solving for C, we find that consumption equals 200. Income is disposed of by households either by spending on consumption or by saving (additional holdings of cash or bonds). Thus, Y ≡ C + S. Solving for S, we find that savings equals 200. Call this Equilibrium 1. Now let’s add government spending (G) = 100 and taxes (T) = 100. Consumption is now given by C = .5(Y – T) = .5(Y – 100). Our equilibrium condition can be rewritten E ≡ C + I + G = .5(Y – 100) + 200 + 100 = .5Y + 250 = Y. The equilibrium condition is satisfied when E = Y = 500. So an increase in government spending and taxes of 100 generates an increase in Y of 100. The balanced budget multiplier is 1. Consumption and saving are unchanged at 200. Call this Equilibrium 2. Now to carry out Scott’s thought experiment in which the balanced-budget multiplier is 0, we have to assume that something else is going on to keep income and expenditure from rising to 500, but to be held at 400 instead. What could be happening? Perhaps the increase in government spending causes businesses to reduce their planned investment spending either because the government spending somehow reduces the expected profits of business, by reducing business expectations of future sales. At any rate to reduce equilibrium income by 100 from the level it would otherwise have reached after the increase in G and T, private investment would have to fall by 50. Thus in our revised model we have E ≡ C + I + G = .5(Y – 100) + 150 + 100 = .5Y + 200 = Y. The equilibrium condition is satisfied when E = Y = 400. The increase in government spending and in taxes of 100 causes a reduction in investment of 50, and therefore generates no increase in Y. The balanced budget multiplier is 0. Consumption and savings both fall by 50 to 150. Call this Equilibrium 2′. Now we can evaluate the effect of consumption smoothing. Let’s assume that households, expecting the tax to expire in the future, borrow money (or draw down their accumulated holdings of cash or bonds) by 10 to finance consumption expenditures, planning to replenish their assets or repay the loans in the future after the tax expires. The new consumption function can be written as C = 10 + .5(Y – T). The revised model can now be solved in terms of the following equilibrium condition: E ≡ C + I + G = 10 + .5(Y – 100) + 150 + 100 = .5Y + 210 = Y. The equilibrium condition is satisfied when E = Y = 420. Call this equilibrium 3. Relative to equilibrium 1, consumption and savings in equilibrium 3 fall by 30 to 170, and the balanced budget multiplier is .2. The difference between equilibrium 2′ with a zero multiplier and equilibrium 3 witha multiplier of .2 is entirely attributable to the effect of consumption smoothing. However, the multiplier is well under the traditional Keynesian balanced-budget multiplier of 1. Scott could have avoided all this confusion if he had followed his own good advice: never reason from a price change. In this situation, we’re not dealing with a price change, but we are dealing with a change in some variable in a model. You can’t just assume that a variable in a model changes. If it changes, it’s because some parameter in the model has changed, which means that other variables of the model have probably changed. Reasoning in terms of accounting identities just won’t do. Update (1/17/12): Brad DeLong emailed me last night, pointing out that I was misreading what Krugman and Wren-Lewis were trying to do, which was pretty much what I was trying to do, namely to assume that for whatever reason the balanced-budget multiplier without consumption smoothing is zero, so that an equal increase in G and T leads to a new equilibrium in which Y is unchanged, and then introduce consumption smoothing. Consumption smoothing leads to an increase in Y relative to both the original equilibrium and the equilibrium after G and T increase by an equal amount. So I withdraw my (I thought) mild rebuke of Krugman and Wren-Lewis for being slightly opportunistic and disingenuous in their debating tactics. I see that Krugman also chastises me in his blog today for not checking my facts first. My apologies for casting unwarranted aspersions, though my rebuke was meant to be more facetious than condemnatory. As I have said many times, Scott Sumner is the world’s greatest economics blogger. What makes him such a great blogger is not just that he is smart and witty, a terrific writer and a superb economist, but he is totally passionate about economics and is driven to explain to anyone who will listen why our economy unnecessarily fell into the deepest downturn since 1937 and has been needlessly stuck in the weakest recovery from any downturn on record. Scott loves economics so much, you might even think that he studied economics at UCLA. So the reason Scott is the greatest economics blogger in the world is that no one puts more thought, more effort, more of everything that he’s got into his blog than Scott does. So, Scott, for your sake, I hope that you get a life; for our sake, I hope that you don’t. The only downside from our point of view about Scott’s obsession with blogging is that sometimes his enthusiasm gets the better of him. One of the more recent ideas that he has been obsessing about is the insight that fiscal policy is useless, because the Fed is committed to keeping inflation under 2%, which means that any fiscal stimulus would be offset by a monetary tightening if the stimulus raised the rate of inflation above 2%, as it would certainly do if it were effective. This insight about the interaction between fiscal and monetary policy allows Scott to conclude that the fiscal multiplier is zero, thereby allowing him to tweak Keynesians of all stripes, and especially his nemesis and role model, Paul Krugman, by demonstrating that fiscal policy is useless even at the dreaded zero lower bound. Scott’s insight is both clever and profound, and if Kydland and Prescott could win a Nobel Prize for writing a paper on time inconsistency, it’s not that big of a stretch to imagine that a few years down the road Scott could be in the running for the Nobel. Okay, so having said all these nice things about Scott, why am I about to criticize him? Just this: it’s fine to say that the Fed has adopted a policy which renders the fiscal multiplier zero; it’s also correct to make a further point, which is that any estimate of the fiscal multiplier must be conditional on an (explicit or implicit) assumption about the stance of monetary policy or about the monetary authority’s reaction function to changes in fiscal policy. However, Scott in a post today has gone further, accusing Keynesians of confusion about how fiscal policy works unless they accept that all fiscal policy is monetary policy. Not only that, but Scott does this in a post in which he defends (in a manner of speaking) Bob Lucas and John Cochrane against a charge of economic illiteracy for believing that fiscal stimulus is never effective notwithstanding the results of the simple Keynesian model. Scott correctly says that it is possible to make a coherent argument that the fiscal multiplier implied by the Keynesian model will turn out to be zero in practice. But Scott then goes on to say that the textbook understanding of the Keynesian model is incoherent, and the only way to derive a positive fiscal multiplier is to assume that monetary policy is operating to make it so. Sorry, Scott, but that’s going too far. So now let’s consider two possibilities. In the first, the fiscal stimulus fails, and the increase in G is offset by a fall of $100 in after-tax income and private spending. In that case, consumption might fall by $10 and saving would have to fall by about $90. That’s just accounting. But since S=I, the fall in saving will reduce investment by $100 $90. So the Wren-Lewis’s example would be wrong, the $100 in taxes would reduce private spending by exactly $100. I’m pretty sure my Keynesian readers won’t like the previous example. So let’s assume the bridge building is a success, and national income rises by $100. In that case private after-tax income will be unchanged. But in that case with [we?] have a “free lunch” where the private sector would not reduce consumption at all. I don’t know what this means. Does calling the increase in national income a free lunch qualify as a refutation? Either way Wren-Lewis’s example is wrong. There is no “either way.” If you assume that the example is wrong, there is no way for it not to be wrong. If viewed as accounting it’s wrong because he ignores saving and investment. If viewed as a behavioral explanation it’s wrong because he assumes consumption will fall, but that’s only true if the fiscal stimulus failed. Viewing anything as accounting doesn’t allow you to prove anything. Accounting is just a system of definitions with no explanatory power, regardless of whether saving and investment are ignored or taken into account. As for the behavioral explanation, the assumption that consumption falls is made with respect to the pre-stimulus income. When the stimulus raises income enough to make post-stimulus disposable income equal to pre-stimulus disposable income, post-stimulus consumption is equal to pre-stimulus consumption. Cochrane ignores the fact that tax-financed bridge building will reduce private saving and hence boost interest rates. This will increase the velocity of circulation, which will boost AD. It does no good to “refute” Cochrane with an example that implicitly accepts the crude Keynesian assumption that savings simply disappear down a rat-hole, and cause the economy to shrink. The Keynesian assumption is that there is absolute liquidity preference, so the savings going down the rate hole is pure hoarding. As I pointed out in my post criticizing Robert Barro for his over the top dichotomy in a Wall Street Journal op-ed between Keynesian economics and regular economics, Keynesian fiscal stimulus works by transferring idle money balances in exchange for bonds at liquidity trap interest rate and using the proceeds to finance expenditure that goes into the pockets of people with finite (rather than infinite) money demand. In that sense, Scott is right that there is a deep connection between the monetary side and the fiscal side in the Keynesian model, but it’s different from the one he stipulates. The point of all this is not to be critical of Scott. Why would I want to be critical of one of my heroes and a potential Nobel laureate? The point is just that sometimes it pays to take a deep breath before flying off the handle, even if the target is Paul Krugman.